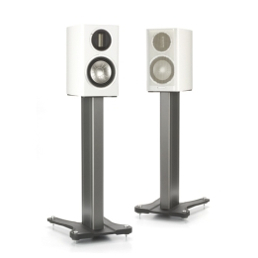 All about the new Monitor Audio Gold GX loudspeaker range at Totally Wired. Simple as it may seem, you'll find that what makes the new Monitor Audio Gold GX range so special is a ribbon. Not just your everyday ribbon however but an ultra-thin sandwich of ceramic coated aluminium magnesium alloy suspended in a powerful transverse magnetic field of high energy NeFeB rare earth magnets. This is the Monitor Audio Ribbon transducer. Almost every other speaker uses a dome tweeter of some description to reproduce the high frequencies. And while these may work well, they also share limitations which the ribbon tweeter overcomes. The ribbon serves as both voice coil and radiating diaphragm, with every part of the ribbon driven directly and simultaneously without energy storage. Having a mass of just 18mg, its diaphragm is able to start and stop in an instant, producing a transient response capable of defining the leading edge and natural harmonic resonance of complex musical sounds. By comparison a conventional tweeter dome and voice coil assembly is much heavier, so is slower, stores more energy and struggles to deal with frequencies above 20 Khz. Which is real problem when the wider bandwidth of new formats like BluRay and 196Khz/24bit recordings. Even a basic analogue system is quite capable of reproducing frequencies up at 60kHz. Specified to reach ultra-high frequencies up to an elusive 60 kHz, MA’s magical ribbon tweeter will reproduce with ease every last nuance and detail from digital and analogue. What this translates to is immediately apparent when you listen to any model in the GX series - these speakers really sing and reproduce high frequencies in a way that leaves most other designs sounding flat footed. In fact the last time we had a speaker with a ribbon tweeter is was Gary Lambert's flgship model - the Virtuoso - which shows he was a man well ahead of his time. Monitor Audio's ribbon tweeter is better than the unit Gary used, and the GX models benefit from around another 18 years of development. All of which should makes a much better speaker for you. Ceramic-Coated Aluminium/Magnesium is a material originally developed by the aerospace industry for jet engine components. Its properties are ideal for loudspeaker cones being extremely rigid, yet light enough to yield high overall efficiency. In manufacture, aluminium/magnesium alloy undergoes a three-stage stress-relieving process to remove surface deformation and molecular weakness. Once formed, the alloy cone is subjected to a high temperature anodic coating process in which a layer of pure ceramic alumina is depleted onto its surfaces to a depth of 50 microns, producing a completely rigid sandwich of alloy and heat-dissipating ceramic material. Conventional cones are liable to flex or twist in operation, producing a significant level of audible distortion. C-CAM cones have a much higher resistance to bending stress and therefore exhibit much greater fidelity over their entire operating range. C-CAM tweeters and woofers share an audible consistency producing a smooth transition of frequencies and a sense of realism and cohesion in the soundstage. Now - let's have a look at the key models in the Gold GX series. The GX50 is the smallest, most affordable and accessible model in the range. And we think the purest distillation what Monitor Audio is about - all of the technologies that grace the bigger more costly models are included. Being physically small pays dividends in terms resonance control, dispersion and sound staging. The simple two way design is easy on amplifiers, so while you might initially think the GX50 needs an expensive amplifier to show what it can do, the converse is true - it will make even the simplest little system sound far better than you expect. Just hook up a little NuForce Icon amplifier to see what we mean. Although smaller than the highly regarded MA Silver series RX1s, the GX50s run rings around them in every area including bass. 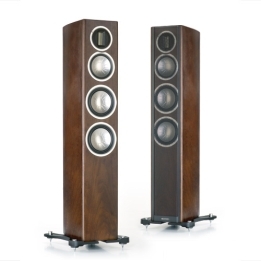 The character of sound is far more agile and they provide a serious challenge to Sonus faber while remaining quite distinctive. Once you hear that ribbon, it gets hard to go back to more conventional designs. The GX200 is the first of the floor standing models. Slimmer and more elegant than many, the 3 way, 4 driver configuration is well proven and delivers a full range sound without sacrificing the speed and staging of the GX50 - in fact the midrange is clearly enhanced. The bass is unexpectedly powerful - we've been listening to a number of other speakers lately that, while physically bigger (and in some cases a lot more expensive), don't seem to have the same control and sustain. The only conclusion we can come to is that by making their own drivers, Monitor Audio are really able to optimize their designs. The multiple divers in the GX200 do demand better control and amplification, but again you don't have to go crazy - they are efficient, so brute force solutions aren't required - it's all about quality. That said, there is a certain attraction to serious power and size and given the chance there was no way we'd pass up the chance to get the Gold GX series subwoofer - a massive 15 inch CCAM metal coned bass diver powered by 650 watts of DSP controlled amplifier in a furniture grade cabinet that requires perfect dead lift technique to safely move (or just use two people). 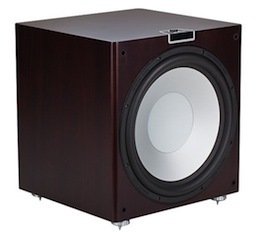 The GXW15 DSP subwoofer is a unique beast. The CCAM bass driver cone is lighter than most, and when intelligently driven by the DSP amp (Digital Signal Processing) which corrects and optimizes performance, it is considerably faster and more subtle than you might imagine. But 650 watts of power efficient Class D amplifier carries a fearsome punch. With automated setup backed up by fine tuning via remote control and an easy to understand menu and display system, you can really make the most of the GXW15.In an ideal world you'd match it with the other speakers in the series for a state of the art home cinema system. But given it's comprehensive capabilities, many other systems would greatly benefit from the massive injection of power and control that the Monitor Audio subwoofer provides. Walnut finish as pictured here without the grill. If there is one thing that is vital in a centre speaker, it's wide dispersion - and what has wider lateral dispersion than a ribbon tweeter? Brilliant! The GXC150 fits the bill perfectly as a partner to the other models in a surround sound system and does a fantastic job at improving vocal clarity with movies, not to mention greatly improving performance for all viewing positions. Right now we've got all of these models in-store and on demonstration. The three other models in the Gold GX range take the equation even further - the GX100 stand mount speaker offers a more dynamic and extended performance than the GX50 by virtue of its larger bass/mid driver and cabinet. The GX300 floor standing speaker and GXC300 centre likewise. Now, we don't pretend that any one company has a monopoly on great sound and everyone will have some form of personal preference when it comes to choosing systems and speakers. We're just like you - we've been looking hard at a whole lot of brands and models lately, trawling the internet and listening to everything we can. But we also have a few real advantages - a lot of suppliers really want to deal with us so you'd be surprised by how much comes our way. We also have some pretty nice electronics on hand, from the affordable right through to some of the best sounding products you can get, so we can get stuck in and find out how speakers perform over a broad range of situations. Experience is good too, but we'd like to think that when a speaker is better, anyone can hear it. All of which brings us back to the new Monitor Audio models - the Gold GX range is seriously good - a big step up for Monitor Audio in terms of both absolute performance and especially value for money. They stack up against the best out there - including other brands we already deal with like Sonus faber and the NZ made Images. And anything else you may care to consider. If you are after that perfect mix of performance, quality of finish and value, these may be just the speakers you are looking for. Why not call us now and find out more? Dark walnut, piano black or piano white finish.